Minestrone Soup is a classic Italian vegetable soup. Super filling with potatoes and pasta, and super healthy with lots of yummy vegetables! 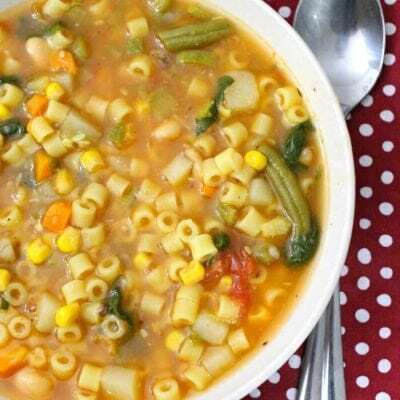 There are few meals that please my entire giant family of seven, but this minestrone soup recipe does the trick! We like to make a big batch at the beginning of the week and enjoy it for lunch with a side salad. If you like Olive Garden minestrone soup, you’ll definitely love this one. I dare say it’s even better! A recipe as versatile as minestrone soup is hard to come by – it’s definitely a pantry cleaner. I’ve included my favorite minestrone ingredients below, but don’t hesitate to change things up if that’s not what you have on hand. Want to make it low carb or paleo friendly, go ahead and skip the pasta and maybe add some chicken breast instead. You can also switch the chicken stock for vegetable stock if meat is a no-go in your home. 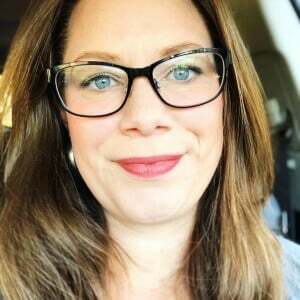 What is in Olive Garden Minestrone Soup? Just like Olive Garden, our minestrone soup includes onion, zucchini, green beans, garlic, and a host of other delicious vegetables! What spices are in minestrone soup? We use salt, pepper, and an Italian seasoning blend. Italian seasoning blends typically include parsley, basil, and oregano. You can also add a bay leaf if you like. 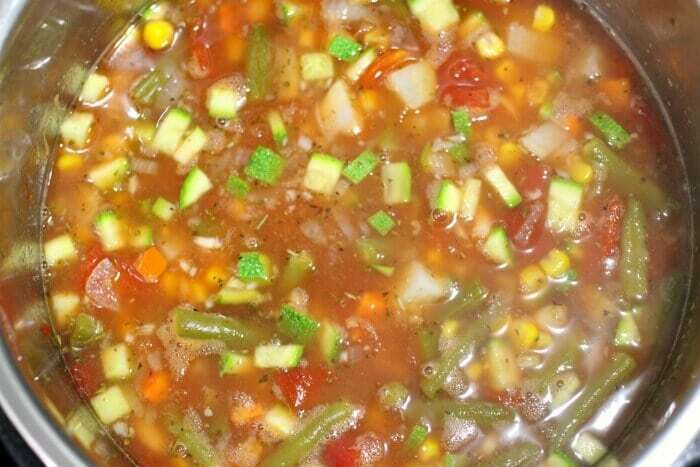 What vegetables do you put in minestrone soup? 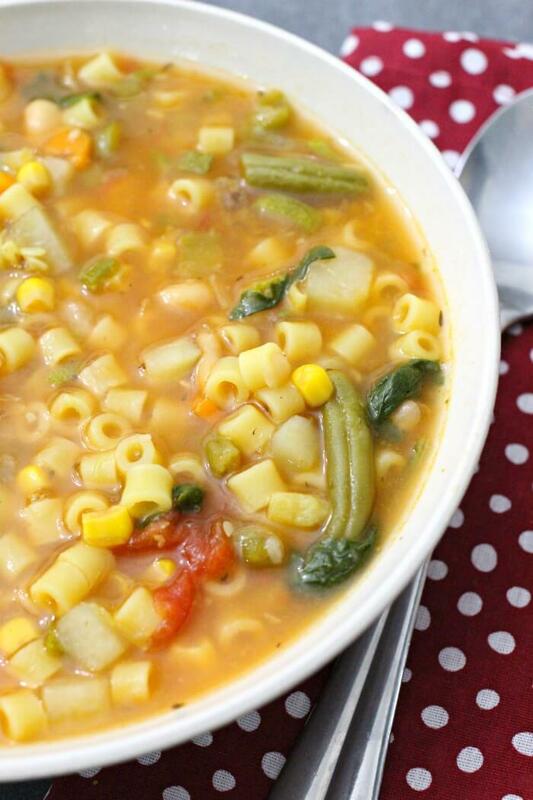 This recipe for minestrone soup includes green beans, corn, tomato, zucchini, and onion. Additional vegetables may be added to taste. What do you serve with minestrone soup? We typically serve a side salad with Italian Vinaigrette Dressing. If we want something heartier, I like to make this delicious Antipasto Salad! 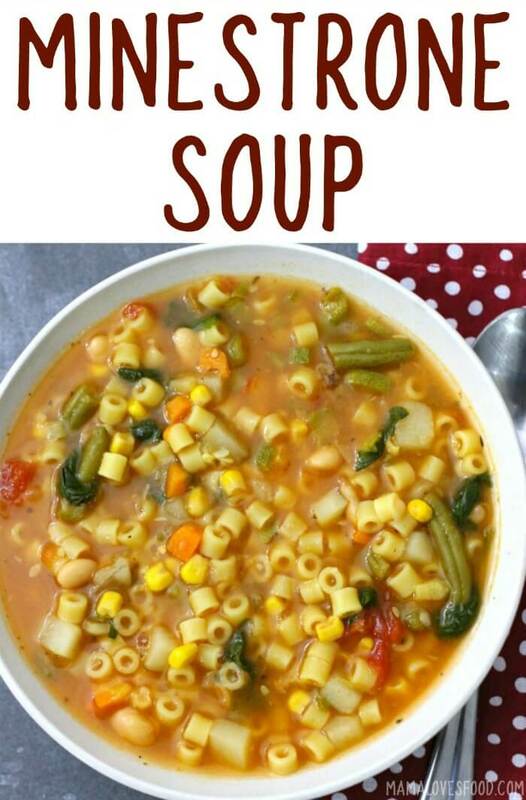 If you love this minestrone soup recipe make sure to check out these other delightful soup ideas! Easy Cheeseburger Soup – For when you want to eat a cheeseburger, out of a bowl. Preferably a bread bowl of course. Mmmmm. SO GOOD. Stuffed Cabbage Soup – I love stuffed cabbage rolls, but making them takes way too much time. This stuffed cabbage soup has all the amazing flavors you want, with none of the hassle! Chicken Alfredo Tortellini Soup – This Chicken Alfredo Tortellini Soup is a whole meal! Perfect for loungy Sunday afternoons. Jambalaya Soup – Add a little spice to your life with this yummy Jambalaya Soup recipe! Creamy Tomato and Blue Cheese Soup – One of my favvvvvvvvvorites. Definitely don’t skip the balsamic drizzle. This Creamy Tomato and Blue Cheese Soup is the best combination of flavors! Creamy Sweet Corn Soup – You won’t believe how few ingredients you need to make this incredibly delicious Creamy Sweet Corn soup! Enameled Dutch Oven – My favorite soup cooking vessel! This one from Lodge has over 5,000 five star reviews! I strongly suggest a dutch oven that is at least 6 quarts. And colorful! Colorful Soup Bowls – Because, colorful soup bowls!!! Why eat out of boring bowls when you can have fun colorful bowls?! Nessie the Lochness Monster Ladle – It’s a lochness monster soup ladle. How does everyone not have one of these in their kitchen?! Cutest ever! 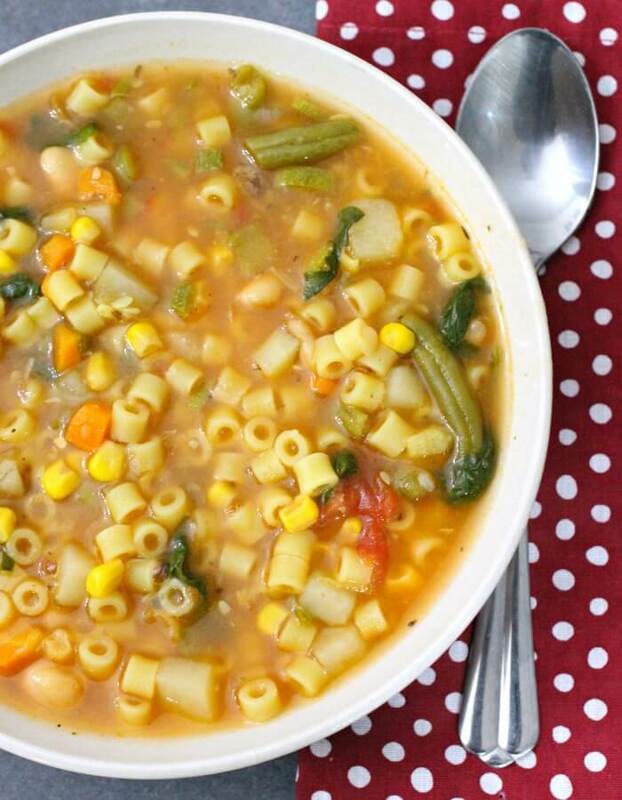 Minestrone soup is a rich Italian soup and the perfect meal for any time of day! In a 6 quart or larger pot, saute onions and garlic in olive oil until translucent, being careful not to burn. Stir in remaining ingredients, EXCEPT pasta and spinach, stir and bring to a light simmer. Cover pot and cook about 20 minutes, until carrots and potatoes are tender. Add spinach and pasta, stir and cover an additional ten minutes, until pasta is al dente. Looks so delicious! Love minestrone soup with some crusty french bread! yes! crunchy french bread is the best! I loved this minestrone soup! Such a great way to warm up on a cold day! Ate two bowls! Made this soup last night, delicious thank you! This soup is total comfort food! I can’t wait to try it!